IMPORTANT Service and Future Repair Information on our Frequently Asked Questions page! 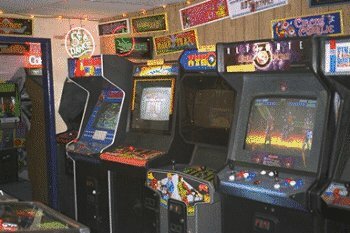 Please read this over so you understand YOUR responsibilities when owning a classic Arcade Video Game. Hyperlinks below show reconditioned machines we have recently sold–this is to give you an idea how the games look when finished! We will take pictures and even a Video of the completed machine for your approval before shipping! Also, please read out FAQ page about shipping and service once the machine arrives at your home, and how the initial warranty and all future service is handled. Deluxe Space Invaders Bally Midway 1981 $2199 Expanded levels of play! Classic! Donkey Kong Jr Nintendo 1982 $2399 Restored classic with new side art! 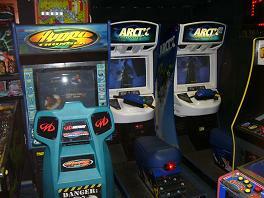 Golden Tee 2005 Incredible Technologies 2005 $1599 5 great courses! Ladybug Universal 1982 $1699 Maze game in cocktail table cabinet—buy as is working for $600! Missile Command Atari 1980 $2199 Classic Game featured in Terminator 2 movie! Pacman Midway 1980 $2199 all time classic in original yellow cabinet–one in stock! For single player, is 26 to 28 inches wide, 5 to 6 feet long and 4 to 5 feet tall. A double player version is usually 5 feet wide, 5 feet long and 4 to 5 feet tall.